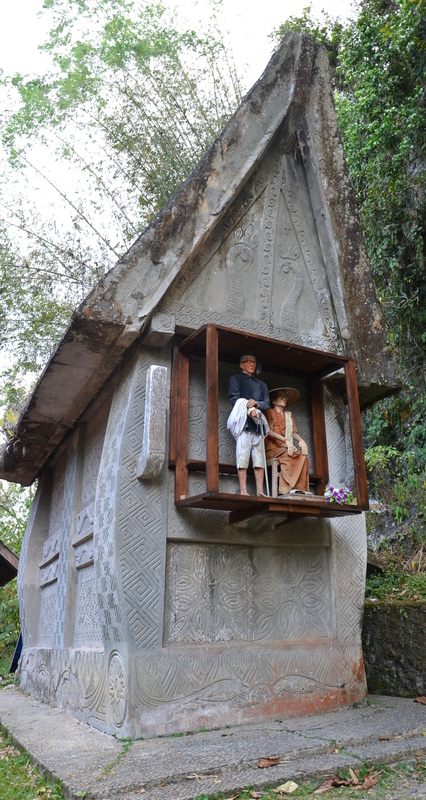 After the elaborate funeral celebration of the life of a family member, Torajan people believe the deceased must be buried between Earth and Heaven. 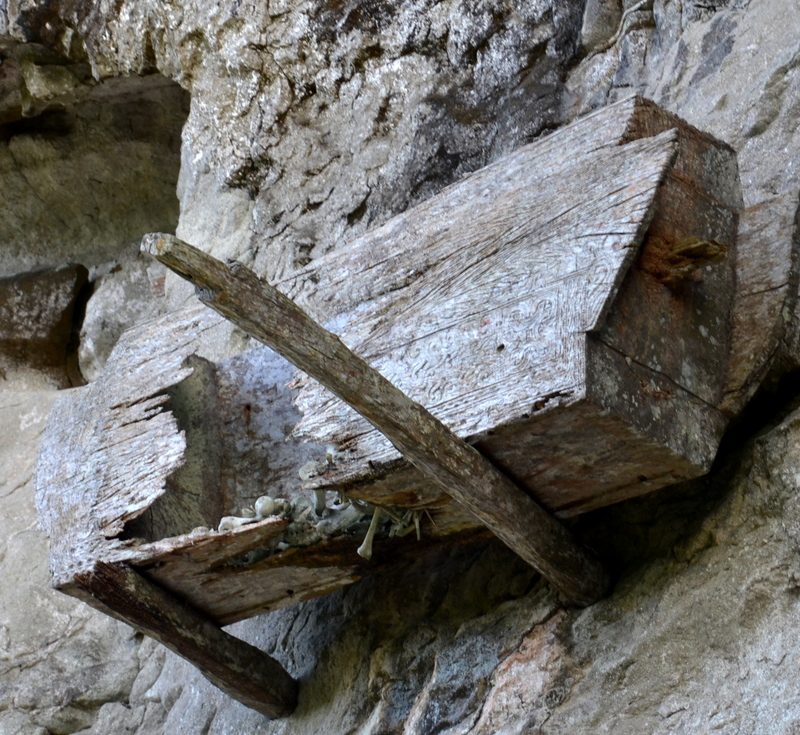 So coffins are placed in rocks, cliffs, trees, or rock walls so the deceased will not be buried in the Earth. And a tau tau is carved to guard the tomb. 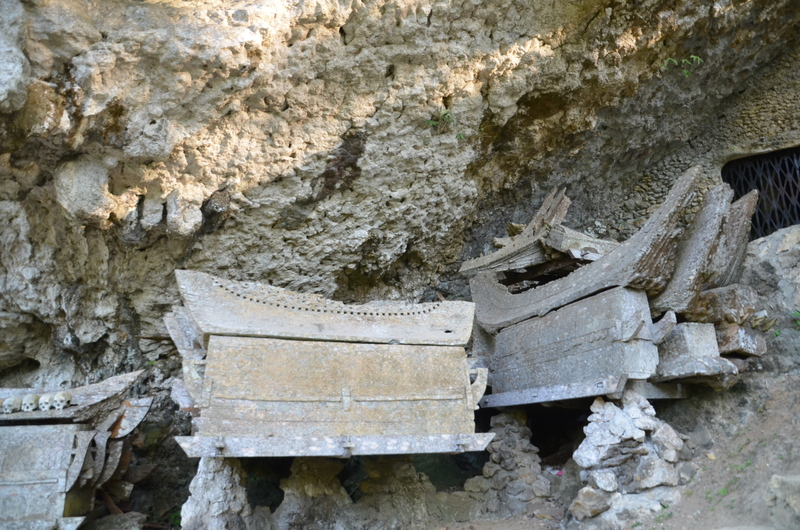 With items needed in the afterlife beside the body, the coffin is placed in a tomb in a rock cliff located in Lemo, Sulawesi, Indonesia, after weeks of chiseling out a big hole. Then the opening is closed with a wooden door and a tau tau placed above it. 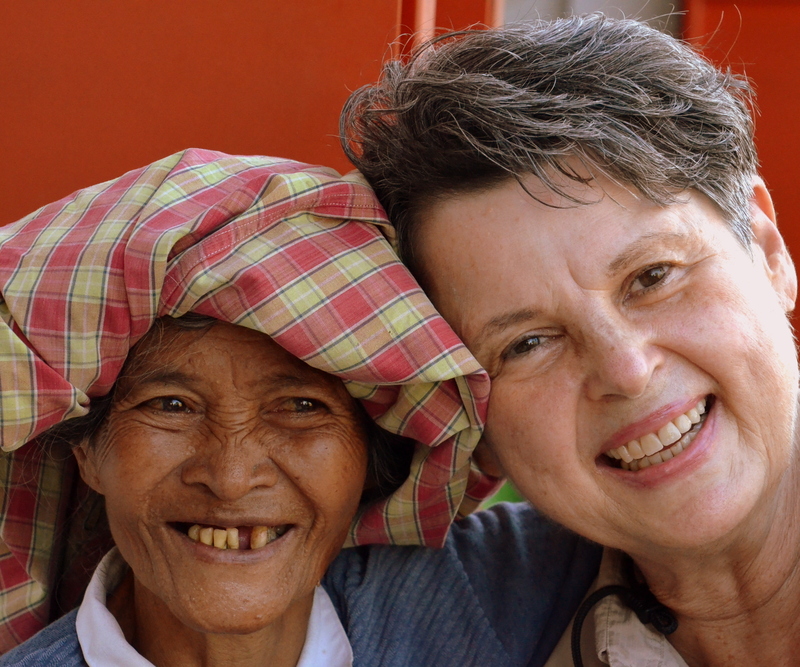 The out-stretched hands of the tau taus offer protection, wealth, prosperity, and good health to family members. 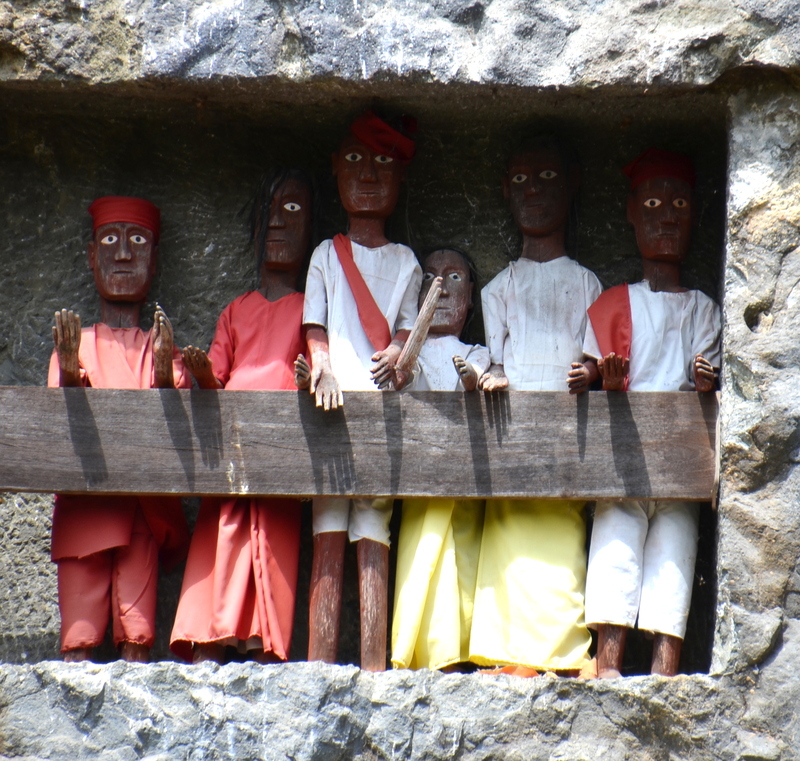 Guarding over the tomb is the hand-carved wooden tau tau, an effigy or likeness of the person in the tomb standing on the adjacent balcony. 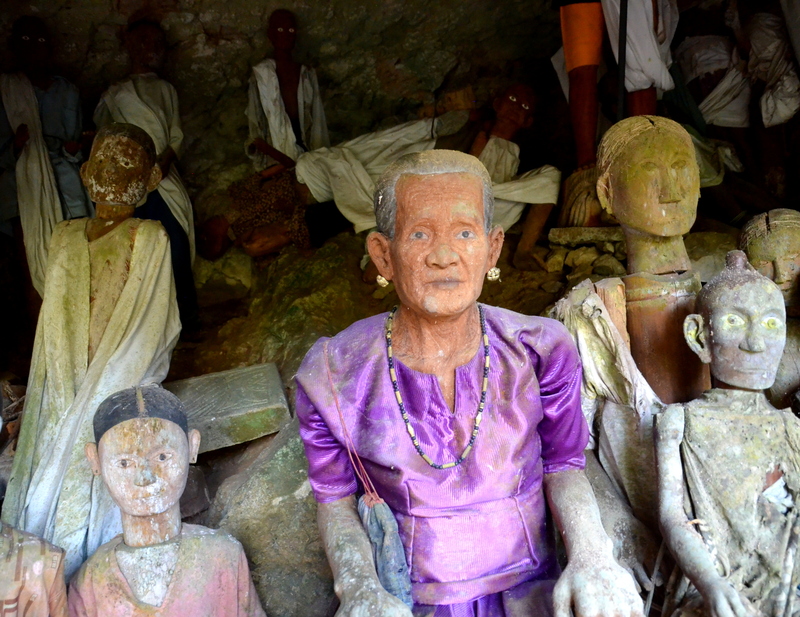 Every August the ritual is held where the Torajan family takes the body from the tomb and washes, grooms and dresses it in new clothes. 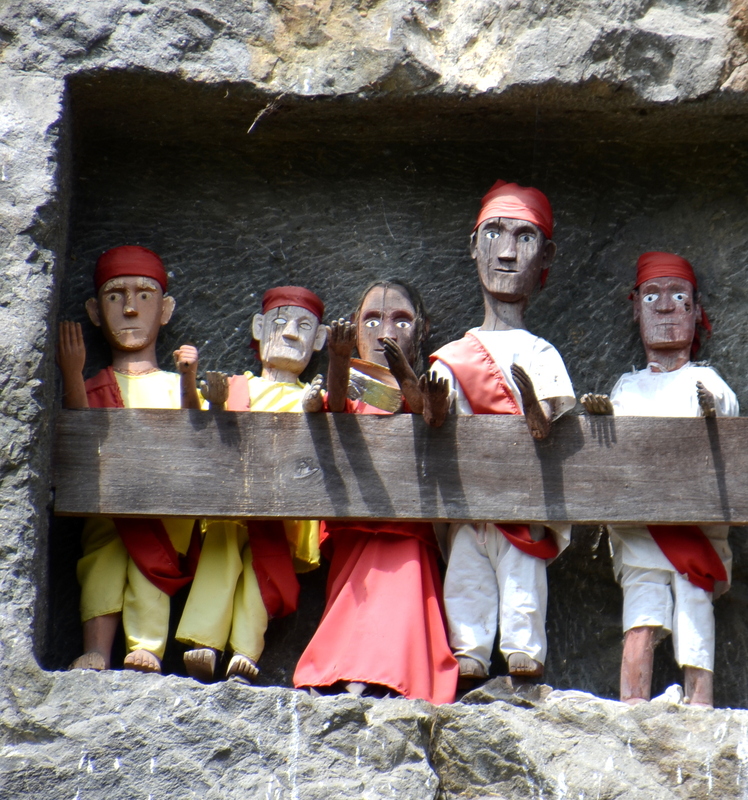 And the effigies are dressed with new clothes and refurbished regularly. 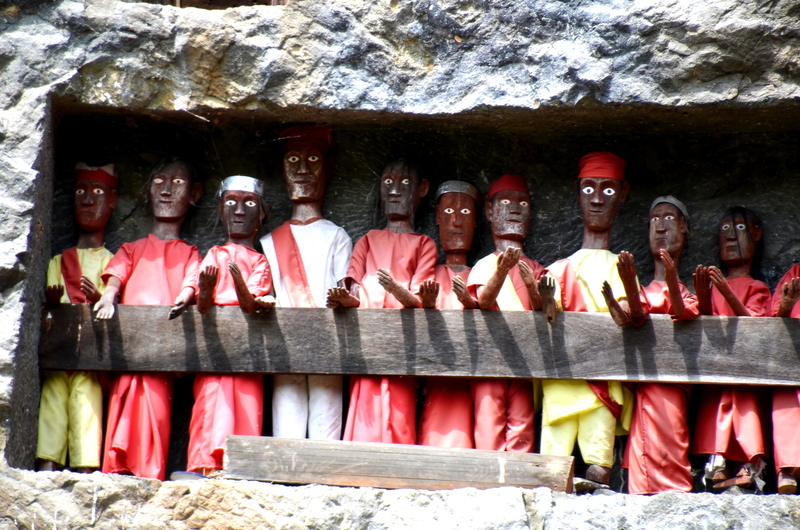 Coffins are repaired and replaced when needed, our Bestway Tours & Safaris guide told us. 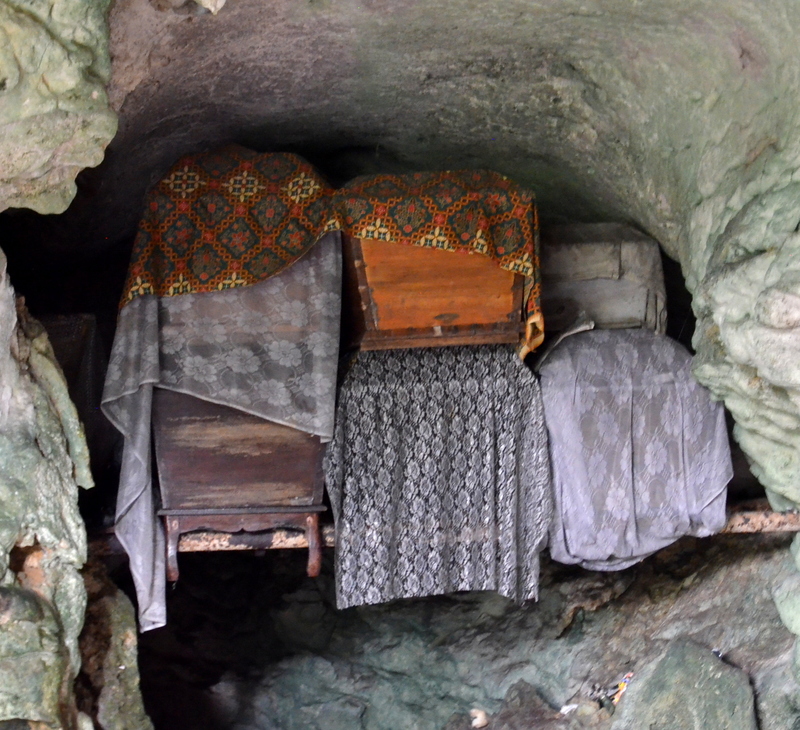 In another burial rock cliff called Ke’te’Kese in Sulawesi, Indonesia, coffins of all shapes and sizes are hung from the side of the cliffs. These are called the Hanging Cliffs. The coffins are repaired and replaced after years of deterioration and many families collect the remains and place them with other family member’s remains in one family communal coffin. 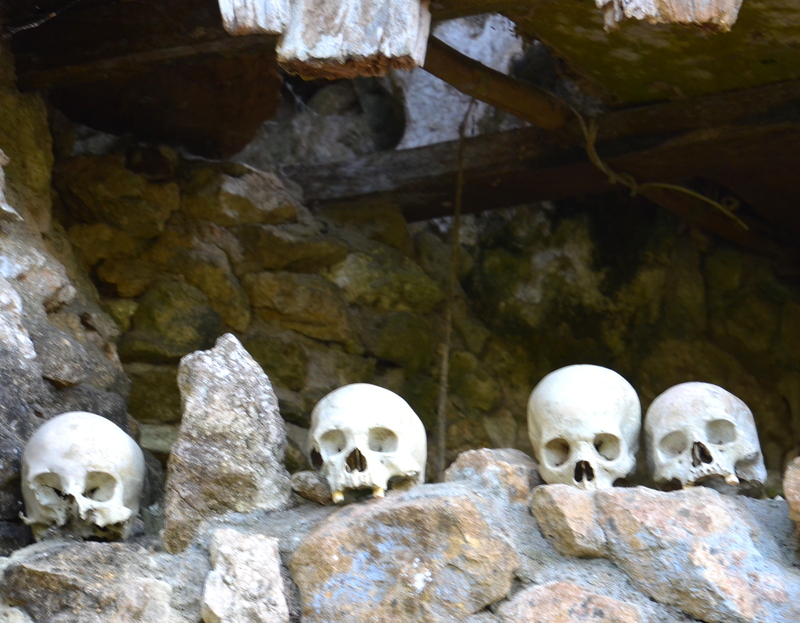 It is not unusual to see skulls on top of the grave at the Hanging Cliffs. When babies die before they have started teething, they are buried in a large pine tree trunk, called the Baby Tree . The deceased baby is wrapped in a cloth and placed in hole dug out in a palm tree trunk. Palm fiber is placed over the hole to close the tomb. As the tree trunk grows, the baby’s remains become one with the tree. 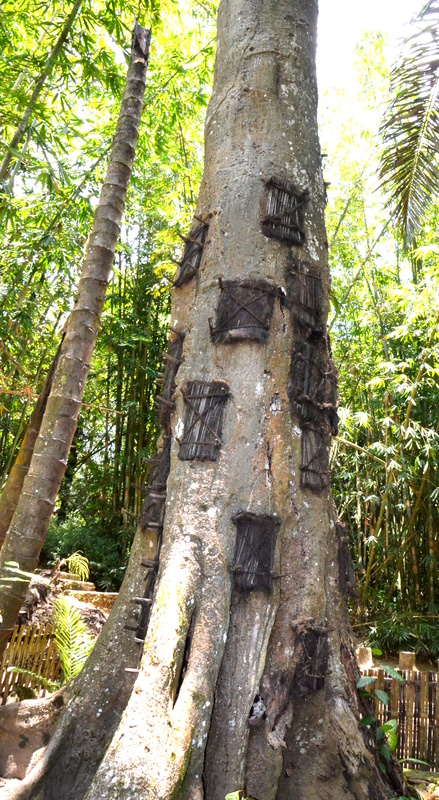 When many babies are buried in the same palm tree trunk, the tree dies. The Torajans have one more place to bury their loved ones. 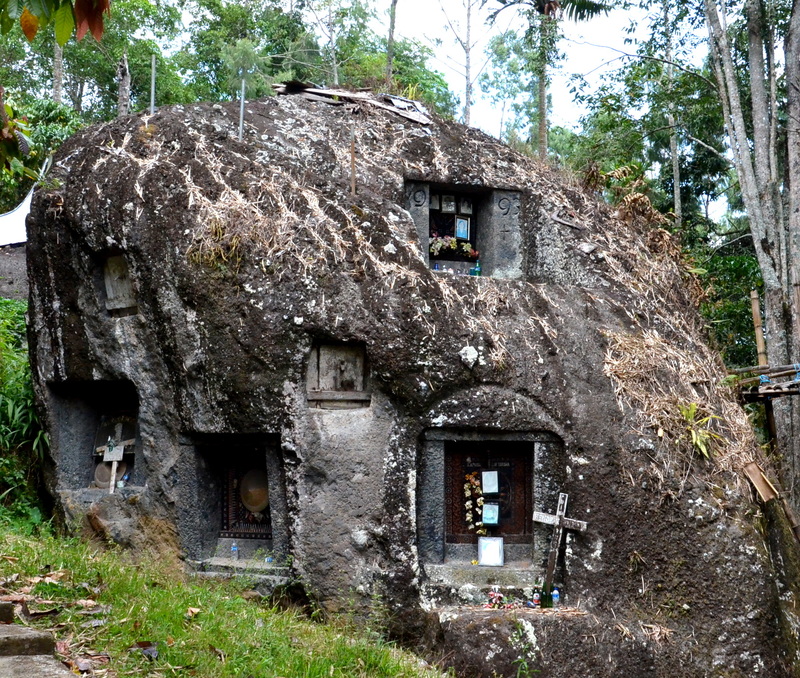 Since the people live in a rocky hilly terrain in the mountains, rocks are used as tombs. Many of the rocks are huge boulders making it a perfect place for tombs. And a tau tau of the deceased person is placed over the coffin to watch over it. 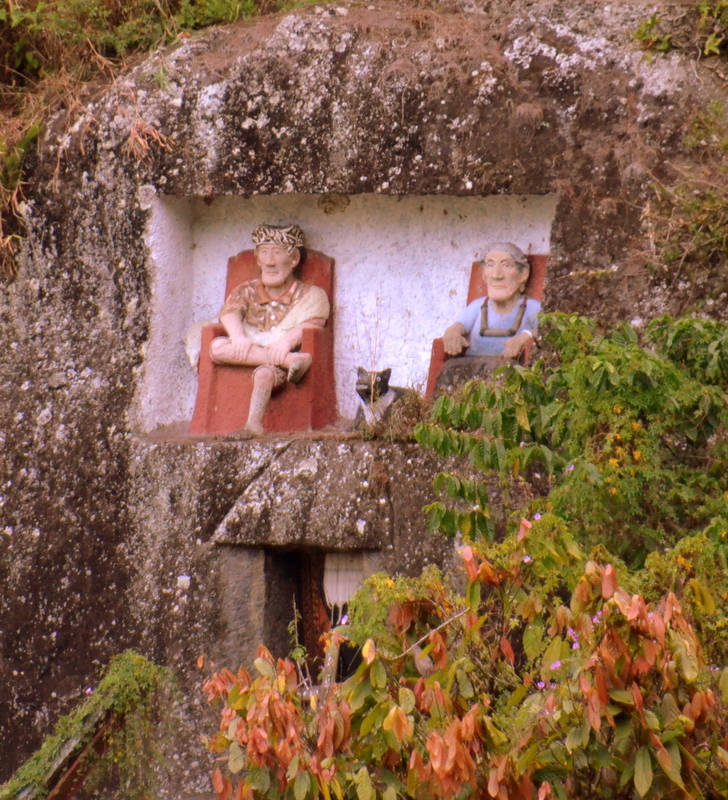 The former King and Queen had their own tomb built. And they guard it to this day. Notice the Queen has her arms out-stretched but her hands are down. She was the Queen. 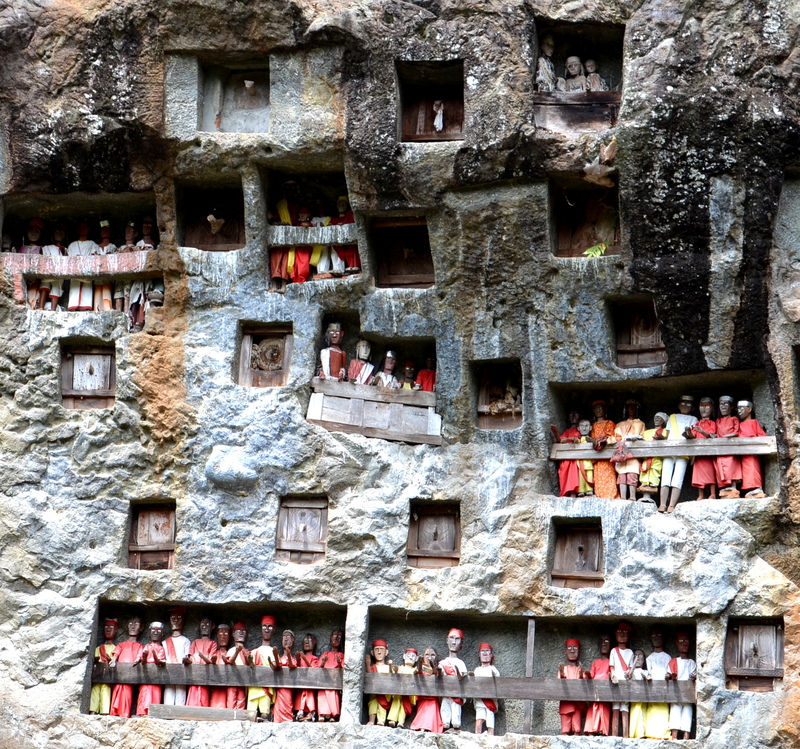 After several years of preparing for the deceased’s funeral celebration, Torajan people then spend weeks preparing the burial tomb located between Heaven and Earth. This is followed with the ritual cleaning and dressing the body every August after burial in rocks, trees, rock walls or hanging from cliffs. A Torajan lady in her traditional headdress.